It might be only one room, but the kitchen is officially painted. Yay for small victories! It took me countless swatches before I chose my perfect gray for the kitchen. You name it, I tried it. Revere Pewter, Gray Horse, Stonington Gray, Serious Gray, Gray Owl among many others. All were too brown, too green, too dark or too blue. Benjamin Moore’s Gray Owl was almost perfect. Certainly a neutral gray in my bright kitchen. But alas, slightly too cold. Then I happened upon Repose Gray by Sherwin Williams. In some lights, almost identical to Gray Owl but with the faintest beige undertone that adds the perfect amount of warmth. I was sold. In a kitchen that is super white like mine, you have to be very careful for those sneaky blue undertones (I’m looking at you, Stonington Gray!!) . Instantly, they will make the space feel cold. The beige undertone in Repose Gray however, instantly warmed up the space while still maintaining that crisp, clean gray look. We love it so much that we are going to use this color throughout the entire first floor and up the stairs. I can’t wait to see how it looks everywhere else. What’s your favorite paint color? Do you prefer to stick to one color throughout, or do you like to have a different color in every space? Catch up on all the other projects we’ve got going on! 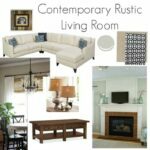 I’m in the process of picking the perfect gray for our new (but pre-loved) home, and I’m loving this post! Your photos are so helpful. Thank you for sharing, and your home is just beautiful!! Repose on ceiling and walls with pure with crown and trim? Just can’t decide if I want white ceilings? We were also going to use it with mindful and Dorian as a ceiling color? How does this color look in rooms with little natural light? My kitchen and living room only have southern exposure, dining room has no windows. Does it stay light or will it look dark? I have it ALL over my house in varying light situations and it’s beautiful throughout. Where it’s really bright, it’s reads closer to gray and where it’s darker it’s definitely more greige but just as stunning. Hi. I have recently purchased new interior doors, and I am thinking of changing to a modern farmhouse decor. I have been told that I should paint my new doors a slightly darker shade of gray than my walls and keep the trim white. I am strongly considering repose gray for the walls. What is your opinion of the doors being a slightly darker gray and what color would you pair with the repose gray? Hi Cindy! Are you set on painting your doors gray? I have repose gray throughout my home paired with white trim, doors and wainscoting and the contrast is pretty fabulous! I really think you can’t go wrong with a crisp white door! Hi Jenna. I really appreciate your response and sorry it took me so long to reply back. I have finally decided to go with SW Agreeable Gray and a crisp white for doors and trim as you suggested. We have replaced all the interior doors and painted them with Kelly Moore Aritic White. They look great! Did you do the Wainscoting throughout your house or just certain rooms? I am thinking about beadboard. But not sure if I should do all rooms. gray color is perfect for your kitchen. Good work! I love how this turned out! I too have been on the hunt for the perfect gray. A friend had the perfect gray in her house and when I asked what the name was it was Repose Gray! Emily, it really is a great color! Gray Owl is fabulous too…it just depends on your light and whether you want something a little cooler/warmer. The repose gray looks so elegant and perfect in your kitchen. Your chairs and table look great in the new house too. I had to pin to some boards to keep this color in mind.